A 5-Year-Old Boy Drowned In A School Pit Latrine In 2014. His Parents Still Seek Justice : Goats and Soda It was a school toilet in South Africa. The boy's death in 2014 sparked a national outrage. The debate about potentially dangerous toilets is still simmering today. Pit toilets located outside of Utjane Primary School in Limpopo province. 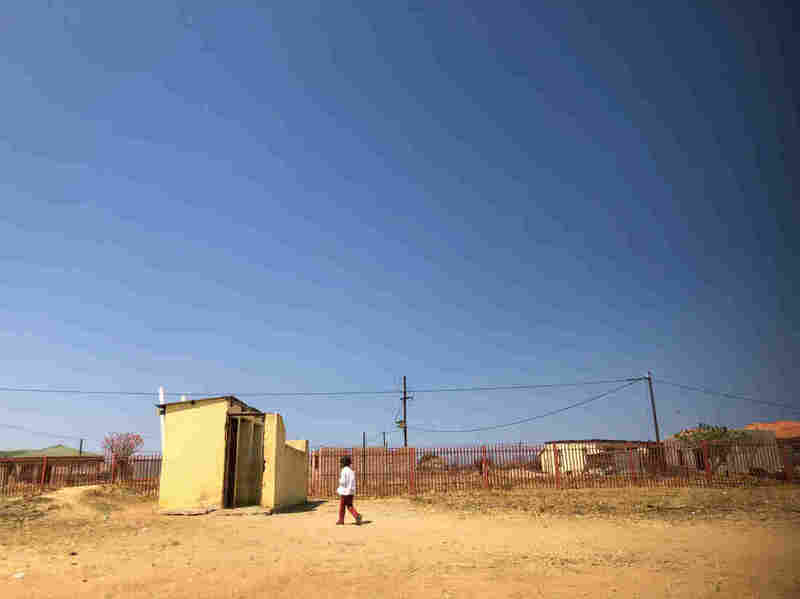 The government of South Africa has vowed to do away with all pit latrines. It was a dilapidated pit toilet — a gaping cement hole that sat over an open pit of raw sewage. Michael, who was alone, fell in and drowned. The school couldn't find Michael initially, and it was hours until James Komape, his father, got a call from the principal telling him what had happened. James walked about 6 miles to get to the school. When he arrived, his son was still submerged in the pit, one hand visible above the sewage. Michael's mother was already there. The school principal stopped them both from trying to take Michael's body out. She told James he had to wait for "first aid" to remove his son's body. James and Rosina Komape. 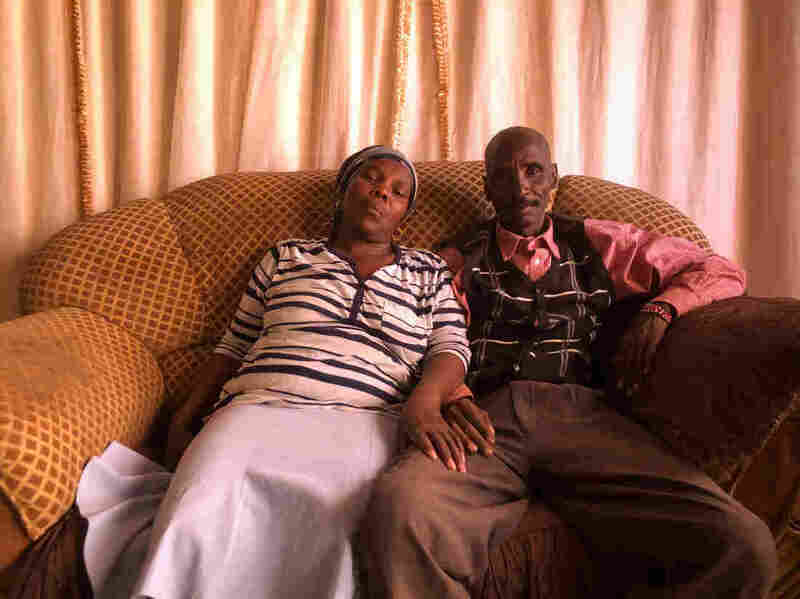 In 2014, their 5-year-old son, Michael, fell in a pit latrine at school and drowned. "When we got to the school, what saddened me a lot was that I found my son was still inside," Komape says, sitting in his living room in Chebeng where he lives with his wife and six surviving children. It's not clear why school officials waited so long to remove his body. Michael's death became a point of national outrage — and his family sued the government in a case that has dragged on for years and is currently before the Supreme Court of Appeals. And then in March, there was another tragedy that echoed Michael's death. Five-year-old Lumka Mketwa fell into the pit toilet at her primary school in Eastern Cape province and drowned. South Africans were shocked such an egregious breach of student safety could happen twice. President Cyril Ramaphosa, who had only been running the country for a month at the time of Mketwa's death, called for an emergency audit of the unsafe sanitation facilities at South Africa's public schools. National education standards say basic pit toilets should not be allowed in schools, and there have been improvements to school sanitation in recent years, according to the Department of Basic Education. But there are still about 4,000 schools that use pit toilets. Another 3,000 schools have newer toilets but have not demolished the pits. In August, Ramaphosa rolled out a public-private campaign to get rid of unsafe pit toilets at the nation's schools within the next two years. "We hope to wipe out these abhorrable latrines from the face of our country," Ramaphosa said in a speech on August 14 announcing the Sanitation Appropriate for Education (SAFE) Initiative. "It can be done, and it starts today. We will do it." Pit latrines are just one of the challenges faced today in poor, rural schools that were marginalized for decades under apartheid. Before white-minority rule ended in 1994, schools for black students were starved of state resources. The right to a basic education became one of the most treasured tenets of South Africa's democratic constitution when it was adopted in 1996. Now Ramaphosa has promised to tackle the problem of substandard sanitation. But there's skepticism among teachers and parents in communities that have been waiting years for better facilities. "School sanitation is not a very high priority in school management," says David Allen Still, a private civil engineering consultant who has surveyed more than 100 school sanitation facilities in South Africa. "The conditions are terrible." In Chebeng, at Michael's school and the other primary school in the village, there was a change after his death. Pit toilets were replaced with safer structures called "Enviro Loos," which contain toilet bowls and seats. But just a few miles away, some schools still use pit toilets, as seen by this reporter during a visit in August. The pit toilets at the nearby schools were safer than the wide-open hole that Michael fell into, but they still pose a risk. At Utjane Primary School, for instance, some of the pit toilets, located hundreds of feet away from the classroom buildings, have a roughly 12-inch-diameter hole over a 6-foot drop to the pit of open sewage below. A very small student could slip in, and if that were to happen, it would be difficult if not impossible to hear a call for help at such a distance, says Malose Elias Serota, a teacher at the school. "Our children are not safe using these toilets," says Mataphelo Legodi, a parent who has two children attending the school. "When a child is in there, you can't see what's happening." Legodi, who works in the school kitchen, has helped one 7-year-old student whose leg got stuck inside one of the toilet holes. She doesn't think anything will come out of the government's pledge to fix school sanitation. "I don't think it will change anything," she says. "The government has already been promising us things." At Sebushi Primary School, a few miles away, the toilet setup — and the sense of skepticism — are similar. The school has instructed younger students — the youngest are 6 years old — only to go to the bathroom with a teacher or an older student. "We did apply [for new toilets], but they said there are many schools who are looking for those toilets. So we are on the waiting list," says Madumetja Kganyago, who has been teaching at the school for more than 25 years. "As you know our government will say they will fix, but eh ... we are still waiting. We don't know." The school's borehole pump also stopped working recently, Kganyago said, leaving the school without water for the last few months and making the school's sanitation problem even worse. On a recent afternoon, Kganyago walked around the back of the block of boy's toilets and pulled back a sheet of rusted corrugated metal sheeting used to cover up an exposed part of the sewage pit. The metal covering is a quick safety fix, and it makes Kganyago nervous. "If they come this side, we're not sure if the learner will be back or not," he says. "One day (the cement structure) may even fall." Due to a lack of public funds, the Department of Basic Education's SAFE initiative has sought help from the private sector and has already raised around $3 million to build new toilets in schools like this one. "Our own budgeted allocations would take us until 2025 if we were to do it alone," says Troy Martens, a spokeswoman for the Department of Basic Education. She says SAFE will not only work to dismantle all pit toilets at schools — both toilets that are in use and older toilets that have been replaced but not yet torn down — but will also fix newer toilets that are not in working order. "We want to ensure that all sanitation is appropriate, safe and fit for purpose," she says. But some say the program's schedule for getting rid of unsafe pit toilets within the next two years is too slow. Sheniece Linderboom, a lawyer with Section 27, the public interest legal group representing the Komape family, says the initiative's timeline is an indication of the state's continuing "unwillingness to treat dangerous school sanitation as an absolute emergency." In 2015, the Komape family sued for damages against the government for emotional shock, grief and counseling costs. Section 27 says Michael's death violated several of his and his family's constitutional rights, including the right to dignity, equality and basic education. The government conceded liability for Michael's death and settled for about $9,200 in the early stages of the trial with the family last year. In the case's full judgment handed down in April, the court dismissed the family's full claim but ordered the government to pay the family another $810 for medical treatment, which according to their lawyer would cover counseling costs. The judge also instructed the government to conduct an audit of sanitation in schools in Limpopo province and to come up with a plan to fix the wider problem. Michael's family is not satisfied with the results. They are now appealing to South Africa's Supreme Court of Appeals for $205,000 over and above those amounts. If the appeal succeeds, the case could set a precedent for how individuals should be compensated when there has been a gross violation of constitutional rights, according to Linderboom. "I was very disappointed in that judgment," says James Komape, Michael's father. "The judge's children are at school and they're safe. Mine has gone to school and he's no longer here." Krista Mahr is a journalist based in Johannesburg, where she has written for The Guardian, The Washington Post, Newsweek and Associated Press. She previously lived in New Delhi where she covered South Asia for Reuters and Time. Contact her on Twitter @kristamahr.